I received this pan a few years ago, loved it but things are starting to stick now. I would buy another one but if I have to keep replacing it every few years I might as well get one that last longer. I love this pan set. Easy to clean and not too expensive. Only thing I didn't like is they don't come with lids. I needed a new pan set and tried one of these. I have since bought an entire set! These are fabulous pots n pans!! The food does not stick and cooks evenly. My children will all get a set of these as house warming gifts!! I also received this pan from houseparty.com. I love it. My food always cooks evenly and clean up is always easy. I would definitely recommend this product. I received this pan from House Party.com for hosting a party. 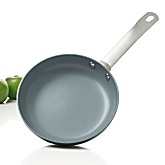 It is my all time favorite non stick pan. I would highly recommend it. It cooks evenly, distributes heat well, and offers easy clean-up.